Detectives at the Zone 2 Police Command, Onikan, Lagos, are unravelling a case of fraud involving an asthmatic patient, Bose (Deborah) Bamidele. Punch Metro reports that the 26-year-old Ikole, Ekiti State indigene, manipulated the voice setting of her phone and pretended to be different persons to defraud her best friend, identified only as Abimbola, of N3.7m, and another woman, Glory Etuk, of about N1m. It was gathered that Bamidele met 30-year-old Abimbola in the Anthony area of Lagos State sometime in 2016. The duo became close friends after the suspect claimed that she had no relatives and her husband and children were dead. As the friendship grew, the suspect invented a character, Dapo Awosika, whom she said just returned from the United States and could make a good suitor for Abimbola. Through telephone calls and Whatsapp chats, Bamidele (while acting as Awosika) defrauded Abimbola of N3.7m. She allegedly created more characters, including an elderly female evangelist, through whom she persuaded her second victim, Etuk, to part with about N1m. The police had received a petition from Abimbola and arrested Bamidele, expecting her to produce her collaborators only to discover that she allegedly masterminded the whole act. Abimbola, who worked with an advert agency, told PUNCH Metro on Tuesday that she could not believe that her best friend was behind her ordeal. She said, “I met her in 2016 when I rented a new apartment at Anthony. She worked as the manager of a cleaner’s on my street and I patronised the shop. She told me that she needed help and that her children and husband had died. I pitied her and shared everything I had with her. “Last year, she said her late husband’s family usually performed a ritual whenever a person died in their family and that they would bring the person’s spirit back to life to give information about his fortunes. Later, she said her late husband had spoken and he said he had a house on Banana Island. She said she was worth billions of naira and needed some money to clear some of the property. I gave her some money. She said the suspect later approached her on behalf of Awosika, saying that his mother was sick at the University College Hospital, Ibadan, Oyo State, and he needed her (Abimbola’s) Toyota Corolla to move around. The victim said after releasing the car, she was surprised when it was not returned as promised. “While we were on this, she said the man needed money to treat the sick mother because he could not access his money in the US. She sent me three account numbers and I sent money in three tranches that totalled about N3.7m,” she added. The bubble, however, burst when Abimbola reportedly found the suspect on Facebook posing with her car. Abimbola said she also read some posts of Bamidele celebrating her daughter’s birthday; whereas she had said all her children were dead. She said after some more investigations, she discovered that the owner of one of the three account numbers she sent money to, whom the suspect claimed was a doctor at UCH, Ibadan, was actually based in Lagos. The woman said when the matter was reported to the police, she further discovered that her virtual boyfriend, Awosika, the supposed sick mother, and other persons she spoke with, never existed and the suspect only invented them to defraud her of the money and her car. “She bears seven names, including Stella, Lucy, Richie and Awuwa. She is Dapo (Awosika) and Dapo’s sister, Modinat, who called me on the telephone and said I should be patient about my car. The police recovered the car at Ladipo market where it was put up for sale. “While I was in shock at the police station, a woman called her telephone line and a policeman picked the call. The caller said she wanted to speak with Mummy Elizabeth who lives in Abuja. That was when we knew I was not the only one she had been defrauding,” Abimbola said. The second victim, Etuk, who was still visibly shaken by the revelations, told PUNCH Metro that she met Bamidele in 2014 at a cleaner’s owned by her (Etuk’s) ex-boyfriend. After losing contact with her, she said they met again in 2016 and the suspect claimed to be in dire need of accommodation. “I had a shop in Surulere where I sold artificial hair. I asked her if she could squat there and she said yes. So, I partitioned the shop because of her and she started living there. I took her as my sister and loved her more than my blood. I talked to her dad, sister and two of her uncles –Uncle Joe and Brother Dapo. “I never knew what was happening until last Friday, when I could not reach her on the telephone and I decided to call Mummy Elizabeth, an evangelist based in Abuja whom she calls grandma. I called many times but the phone rang out. “Later, a man picked the call and I told him to give the phone to mummy. He said I could not talk to her because she was busy. He cut the call. When I called back, the man interrogated me before saying Mummy Elizabeth had an accident on the Third Mainland Bridge. “I was surprised because I spoke to the old woman the previous night and she didn’t tell me she was coming to Lagos. I wondered how she could be on the Third Mainland Bridge that day,” she said. She noted that she called Bamidele’s number to inform her of the purported accident, but she was unreachable, adding that she was surprised when Bamidele was brought by some policemen to her shop some minutes later. 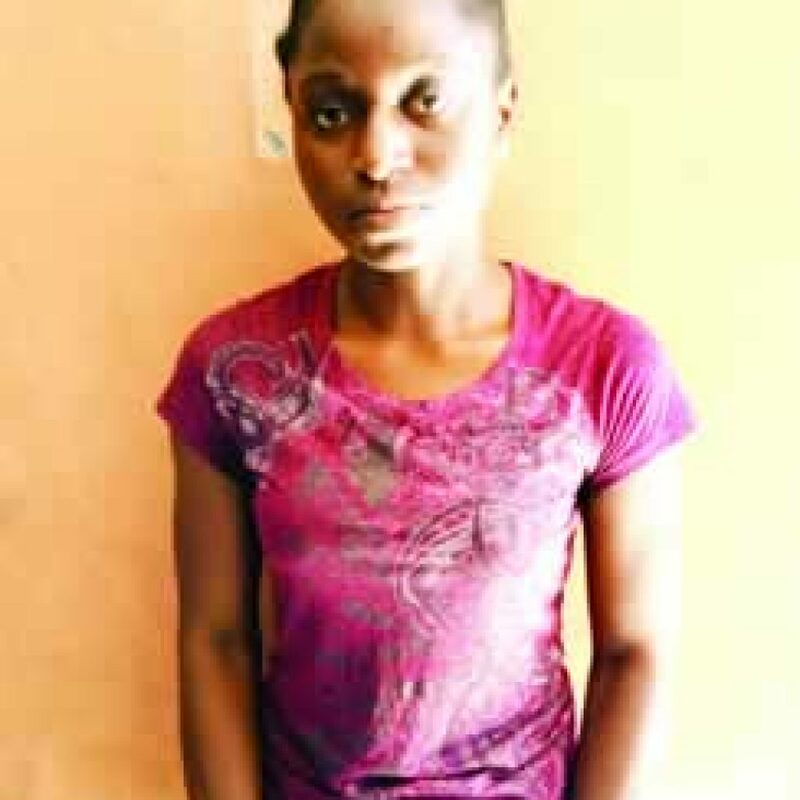 She said Abimbola, who was with the policemen, narrated how the suspect defrauded her (Abimbola). “Abimbola told me that she (Bamidele) was the Mummy Elizabeth I had been speaking with. I asked her and she (Bamidele) confirmed it. That was when I knew I was done for. She always told me that her sister was sick, and so far, I have lent her about N1m. I borrowed money from two microfinance banks. A daily contribution is included. I operate two bank accounts, and I can’t even boast of N500 in any of the accounts. “It was Mummy Elizabeth that usually convinced me on the telephone to lend her money that the brother would pay me back. At times, her father would call me to thank me for caring for his daughter. Even Uncle Joe, I talked to him often until he fell sick last September. And that sickness took so much money from me. I thought we were family,” she added. Bamidele, who was paraded at Zone 2, told our correspondent that she played all the roles. The suspect demonstrated how she deceived her victims by changing the voice settings in her phone. Bamidele, who claimed to be from a broken home, said she was ready to face the consequences of her actions. She said, “I had a boyfriend that time and I told him that I worked with Unilever Plc and the man thought that I earned a lot of money. Abimbola was sending money to me (as Awosika) and I spent the money lavishly. I also collected her car, which my boyfriend thought was mine. The Zonal Police Public Relations Officer, SP Dolapo Badmos, warned Nigerians to avoid sending money to strangers.